And I am FLOORED that this week we are seeing a man who brutally circumcised his infant sons at home with a box cutter, leaving one of them to bleed for 11 hours straight, and he gets a 'misdemeanor child abuse' charge of 120 days jail time (max); Then there is the safe, gentle homebirthing family with child endangerment charges against them; And then THIS man - who tattooed his 7-year old son (who requested the tattoo in the first place) gets possible LIFE in prison?! Enrique Gonzalez wanted his 7-year-old son to have a gang tattoo, like the many that adorn his own body. About that there is no dispute. The question that a judge says she will decide Friday is whether placing a tattoo on a minor is a permanent and painful disfigurement worthy of the potential life sentence that comes with a mayhem conviction, or is it something less? Are there other procedures children routinely undergo that are decidedly more painful and permanent? The tattooing case became international news in April, not just for the quarter-size dog paw print on the right hip of the young boy, but for what the paw represented: Fresno's most notorious criminal street gang, the Bulldogs. Gonzalez and fellow gang member Travis Gorman were arrested on charges that also include street terrorism with enhancements related to gang activity. 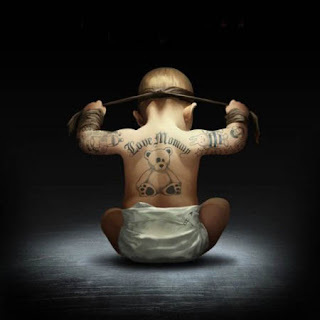 Placing the gang tattoo on the child, prosecutors allege, is a recruitment tool that furthers the gang's criminal enterprise. For three years, the Fresno police have been engaged in tactical warfare with the Bulldogs, sweeping through neighborhoods and calling the media to announce arrests. The resulting stories make the Bulldogs as infamous as the town's original Bulldogs — the mascot and moniker of California State University, Fresno — are beloved. Nothing, however, has garnered as much widespread publicity in recent years as a father, his son and the paw print tattoo. "I had mothers calling me from Australia wanting to get this guy," said Det. Jesse Ruelas, who investigated the case. Law enforcement officials threw the book at Gonzalez and Gorman. But testimony at the preliminary hearing this week to establish which charges the evidence supports gave pause to Fresno County Superior Court Judge Hillary Chittick. A defense attorney, seeking to undermine the potential mayhem charge, raised the issue of a painful, irreversible, and increasingly controversial medical procedure with the boy's pediatrician, a witness for the prosecution. "Which is more painful, circumcision or a tattoo?" asked public defender Manuel Nieto about the practice performed on a decreasing number of newborn boys. "I would guess the circumcision," Dr. Carmela Sosa responded. "Do you recommend it to your patients?" "There may be medical reasons that develop, but not on a routine baby." For decades many mothers have pierced the ears of their infant babies, a practice Sosa said also is painful. And in some cultures the tattoo has been a symbolic rite of passage, given to children as protection from the gods or to identify membership in a clan or social group. It is a misdemeanor in California to tattoo anyone under the age of 18. But prosecutor William Lacy conferred with gang investigators before applying the more sinister charge of aggravated mayhem, which California statutes describe as "extreme indifference to the physical or psychological well-being of another person" that intentionally causes disfigurement "unlawfully and maliciously." Conviction means life in prison with the possibility of parole. "It seems to the court," Judge Chittick said as she asked Monday for a few days to think, "that mayhem requires a certain level of bodily injury, and I'm not sure a quarter-sized tattoo meets that." Disfigurement doesn't have to be permanent to qualify as mayhem, says law professor Laurie Levenson, director of the Center for Ethical Advocacy at Loyola Law School. Gonzalez could argue that he didn't intend to harm his son, she said, but that won't necessarily take the life sentence off the table either. "It's an interesting issue," Levenson said. "I don't think kids belong to their parents. You can give a child the haircut you want him to have, but you can't permanently disfigure a child." Gonzalez granted his son's request for the tattoo because the son begged "I want to be like you," the defense says. But the prosecution says Gonzalez held the boy down while Gorman forcibly applied it. Either way, says Levenson, "I don't know if children can readily give permission for a tattoo." In court this week Gonzalez' estranged wife, Tequisha Oloizia, testified that her son suddenly refused to change clothes in front of her after he returned from an Easter break visit with his father. "I thought it was a boy thing," she said. A few weeks later, as he lay stretching in his pajamas, she saw a black mark on her son's hip. Gonzalez told her the tattoo was "the result of a misunderstanding" and promised to have it covered with flesh-colored ink, she said. Instead, this month the boy began laser removal at a local doctor's office, performed after a topical application of painkiller and a local injection of lidocaine. Two men facing life sentences for having a quarter-size gang sign tattooed on a 7-year-old boy’s hip caught breaks Friday. Enrique Gonzalez, the child’s father, let out a long sigh when a judge said the act was not aggravated mayhem, a charge normally reserved for crippling attacks. Instead, Gonzalez and his friend Travis Gorman will face the lesser charge of cruel and inhumane treatment of a child in a notorious case that has captured worldwide attention. They now face seven years in prison. Had the mayhem charges stood, they would have faced life terms. The two were arrested after Gonzalez’s estranged wife found the tattoo and called police. The paw print, which was applied in April, is being removed. and removing that tattoo is going to NOT hurt?